virus, malware, spyware and malicious websites. Comodo's award winning firewall protects you from virus, malware, spyware and malicious websites. Upgrade to our full security suite Internet Security Pro which includes Firewall, Antivirus, instant live support and more! Comodo Firewall Pro brings a revolutionary change to internet security with Default Deny Protection (DDP?) technology. The security tool provides the very best protection against online threats like malware, spyware, trojans and hackers. Conventional security programs which determine if a file should be allowed access to the computer based on offline malware definitions. If the definition misses some entries or doesn't have updated malware list, virus and malicious codes will easily gain access to your PC. The most prominent step towards a secure online experience is using a quality firewall program. 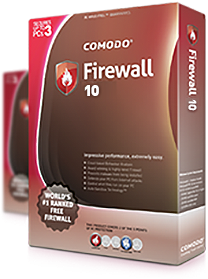 Comodo Firewall is free and has access to a safe list of PC-friendly applications, an integral component of Default Deny Protection™. Need time to consider a full upgrade? Get free firewall protection first! Sandbox is a virtual operating environment where programs that have not been verified as safe can be executed. This protects you even against threats that have not been identified yet. Based on individual user preference, automatic behaviour analysis allows frequently accessed files and blocks unidentified programs with managed alerts. Cloud-based behaviour analysis system identifies zero-day malware immediately. Cloud-based whitelisting of trusted programs detects PC-friendly files and trusted vendors. Scheduled scans, alerts and virus warnings are suppressed in game mode to allow hassle free gaming experience. Application control allows users to completely lock down their PC and provide access to verified programs. Categorized warnings specify the type and level of threat from each source. Simple, quick and efficient. Comodo firewall will scan after installation and automatically add all existing programs to the safe list with a single click. Access current security settings easily with an at-a-glance snapshot. Point-and-click setup to access pre-set security level settings and make changes easily. Get exclusive access to Comodo safe-list containing over 2 million known PC-friendly programs. Comodo Firewall monitors your activities to create 'allow rules' and identifies trusted programs to minimize alerts in training mode. How does a firewall work and why is it important? Firewall protection is a data packet filtering tool which secures your PC by scanning incoming and outgoing communication to barricade malware entry. How does Comodo firewall differ from dozens of firewall solutions provided by other vendors? Comodo Firewall is the only program which has Default Deny Protection? technology to provide maximum security to your computer. Combined with Auto-Sandboxing, your system is immune to fight against any threat. You can also choose to allow or deny access to programs specifically. Do I have to determine all programs to allow or deny access? Not at all. The Comodo Firewall has full access to Comodo's safe-list comprising of over 2 million identified PC-friendly programs. Whenever an application or file from the list requests access to your computer, it will be instantly granted without questions. What if a file unavailable in the safe-list requests access? Comodo firewall alerts you whenever unidentified files request access with detailed information on the threat level and the type of file.